A portal is one of the most important components in a Service Oriented Architecture (SOA). IBM WebSphere Portal is available for a variety of platforms, including z/OS and z/Linux. 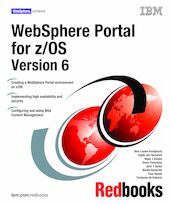 In this book we discuss IBM WebSphere Portal Enable for z/OS Version 6.0.0.1 , which combines the rich functionality brought by IBM WebSphere Portal for Multiplatforms with the Qualities of Service provided by the z/OS platform to provide a robust computing platform. The information in this book is based on experiences gained during an ITSO Proof of Concept in which we installed and configured WebSphere Portal on z/OS in a highly available and secure environment. It is targeted to those who need to implement Portal in System z environments.